In the same way as the previous Keramag Preciosa series, also the successor Keramag Preciosa II harmonizes with every furnishing style thanks to its precise circles and edges. 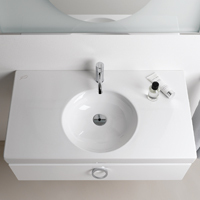 The perfect supplement to the Keramag Preciosa II hand wash basin is the towel holder, which are mountable directly to the wash basin, regardsless whether it is a towel holder for the hand wash basin in the guest bathroom or two towel holders for the large wash basin in the main bathroom. The combination the Keramag Preciosa II wash basin with the squared Keramag Preciosa WC or the Keramag Preciosa bidet brings calmness into the room thanks to the uniform rectangular form of all Keramag ceramics and thus creates a very special atmosphere.